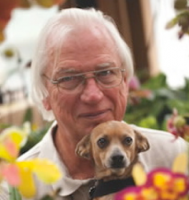 Ron MidgettWe are pleased to welcome Ron Midgett of New Earth Orchids, NM, as our speaker for February. Ron is an accomplished orchid hybridizer who will be describing his cattleya hybridizing efforts with a talk entitled ‘Beyond Sc. Beaufort – A 20 Year Odyssey in Cattleya Breeding’. Ron’s visit is being co-sponsored by POS and SDCOS, thus he will be talking about his experiences with oncidium hybrids at SDCOS on Tuesday evening with the talk “Oncidinae Intergeneric Hybrids—What Are They and How Do I Grow Them?”. He also will be providing the POS opportunity table and have some of his novel cattleyas crosses available for purchase. Ron began growing orchids in 1969 in an orchid-rich environment of Southern California. Since then, he has grown orchids in many different regions of the US and in the Caribbean for 3 years. Currently, Ron resides in Santa Fe, New Mexico. He is a breeder with an emphasis on Cattleyas, Paphiopedilums, and Oncidinae. Several cultivars from his crosses have received AOS awards. In 1990, Ron founded the New England Orchid Company in Franklin, MA. In 2003 he moved his orchid business to New Jersey and changed the name to New Earth Orchid Co., aka, New Earth Orchids. In 2010, New Earth Orchids was moved to Santa Fe, NM. Ron is an accredited AOS judge currently serving in the Rocky Mountain Region. He as served as chairperson of AOS judging for the 2011 and 2012 New Mexico Orchid Guild Shows. In 2011, Ron was invited to participate in judging the Taiwan International Orchid Show. Ron has authored articles published in Orchids and most recently in the Orchid Digest, which gave him the prestigious Ernest Heatherington award for his article ‘Beyond Sc. Beaufort – A 20 Year Odyssey in Cattleya Breeding’. Ron feels a special honor in receiving this award because Ernest was one of his first mentors.